The Baja Beat Let Baja Entertain You! Papas & Beer is a popular party place... especially during Spring Break!In the past, I’ve mentioned before in this column that Baja has a little for everyone, from just lazing on the enjoying wide sandy beaches, to surfing or, horseback riding, to deep sea fishing and golfing, and for to the more adventurous, hang gliding, rock climbing and off-roading. To further promulgate the popularity of Baja California, especially the area around Rosarito Beach, there are other sources of entertainment available, from partying hearty in all-night disco clubs to getting pampered with massages, facials, pedicures and manicures in several upscale spas. Rosarito Beach, just a half hour south of the border, has become one of North America’s top Spring Break destinations, and with good reason. At night, the places that cater to the college-age set become crowded and loose, with amped music drowning nature’s crashing of the nearby waves. At some of these wild and crazy bars you can ride a mechanical bull, play volleyball in the sand, abuse the local tequila and beer, and dance and party until the roosters crow. Concert-goers in Rosarito Beach. Much of this night-timenighttimeparty action is centered around and near the Festival Plaza Hotel, which was designed as a party place hotel when its was built in 1994. Now a little long in the tooth, there are with numerous tiles chipped and missing from the art deco black and white sea serpent and green and red watermelon art that surrounds the central courtyard. That would hardly be noticablenoticeable at night when the two-and-a-half acre hotel and entertainment complex place is crowded with revelers, sometimes enjoying concerts in that courtyard. One popular Festival Plaza venue of. Of note is the small streetside bar, El Museo Cantina, which boasts the world’s largest tequila collection. Rock and Roll Taco, a jumping joint that puts the “party” in the word “taco” fronts the Festival Plaza complex. There, DJs and live bands, featuring everything from classic rock to current pop accompany those party animals shooting tequila or conga dancing around the pool. Within a short two or three block distance from the Festival Plaza are Club Iggy’s www.clubiggys.com and Papas & Beer www.papasandbeer.com. Nightlife at Club Iggy’s is a year-round happening, with Spring Break being especially crazy. Billing itself as “the hippest place in town,” Club Iggy’s, which has a capacity of 5,000 party-goers, features some of the hottest acts around. The beachfront nightclub has resort-like amenities, including five dance floors, eight full bars, two go go stages, an inside bungee jump, mechanical bull, and foam party area. Papas & Beer, with another location in Ensenada about an hour farther south, celebrates its 24th year of wild party entertainment. The Rosarito location, with 47,000 square feet of white sand inside the bar complex (capacity 7,000) is the largest beach club on the west coast. It is definitely the place to be. It’s open all year from 11am until 3am, but for holidays like Spring Break or Labor Day, extends those open hours from 10am until 5am. Other Rosarito hot spots are the Club Boom Boom, Club Animale and the Club Maya. There are several Rosarito Spring Break package deals available, one at www.mexicospringbreak.com. More sedate entertainment can be found everywhere in the Rosarito Beach area, from karaoke bars to elegant piano music, with everything in between and mariachis wherever you go. Not all of Baja’s entertainment is confined to dancing the night away. For many, instead of (or in addition to) partying, a relaxing day spent at a spa is what it’s all about. Following are a few spa options in the Rosarito Beach area: By the way, several of these offer discounts through either the Rosarito Tourist & Conventions Bureau booklet or the Baja Times, both widely distributed. Check your hotel lobby. The new Day Spa and Beauty Center at the Calafia Hotel www.hotel-calafia.com also offers numerous therapeutic treatments and beauty services, ranging from full-body massages to salon-type hair, facials, special bride’s hair and makeup treatments, full waxing, manicures and pedicures. A little farther south down the road is the Las Rocas Resort and Spa. This beautiful hotel, with an infinity pool on the rock framing a Pacific sunset, probably has the most varied spa menu offered by its all-certified staff. In addition to typical spa offerings, they feature local resources, including seaweed, jojoba oil and Baja sea salt. Las Rocas offers couples’ massages, and has a coed sauna and steam room for couples to enjoy. 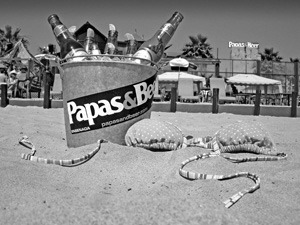 www.lasrocas.com. Greg Niemann, long time contributor to the SC Journal, is the author of Baja Fever, Baja Legends, Palm Springs Legends, and Big Brown. www.gregniemann.com.